Tell me about your personal history. I am a product of two different worlds, one here in Canada and one in Germany. My mother and I immigrated to Canada, but I always maintained a deep connection with my German roots. In Canada, I set about adjusting to my new life, learning English, starting school, and attempting to make friends. It was a difficult time. The normal anxieties experienced by any child were amplified, since I was not only starting something new and different on my own for the first time, but I was also doing so in a new language that I was not yet completely comfortable with. Visiting my family in Germany therefore became my solace. It was relaxed and comfortable, creating a sense of nostalgia that most children never experience. While I was there, I felt like I was truly home. It was a place connected to my earliest experiences with those I truly loved. I remember collecting daisies with my Opa and baking with Oma, climbing the tree that Opa planted for me in his back yard, and so much more. I returned to my magical home every year, often flying by myself to do so. I braved busy airports and complicated customs claims as a child and have ever since. This gave me the confidence and courage to tackle any challenge that I faced in order to become who I am today, but it also added extra challenges that sometimes required the help of others. I didn’t receive Canadian citizenship, for example, until I was eighteen. My mother is the daughter of a Canadian soldier, so she received her citizenship easily. The same did not apply to me, however, and I missed out on normal opportunities as a result of this. I could not get a driver’s license, for example, until I became a citizen. But this was not something I could do on my own. I had some lucky connections though. My friend’s father, Reg Helwer, was my local MLA, and he agreed to sponsor me. If it were not for him, I could not call myself a Canadian. So here I am, a woman formed by the challenge of adapting to a new life in a new country and with a deeply rooted connection to my ancestral home. I am currently in my final year of the Bachelor of Tuba Performance programme at Brandon University, but I began my music career in middle school at the age of twelve, picking the biggest instrument I could play. I continued on with this while in high school at Vincent Massey and I haven’t looked back since. Once I started playing I just knew that music was something I always wanted to have in my life. I was recently accepted to play with the Royal Winnipeg Rifles band as first tuba. This powerful recognition from others gives me great satisfaction, and I am proud to be entering the Canadian Armed Forces as a musician. It is my way of giving back to this great country that I have come to be a part of. But more importantly, I am proud to be breaking the stereotype of the typical tuba player; a big burly man. I bucked the trend, carving my own path. I am proud to be able to teach younger players, going to schools to teach clinics and being able to inspire young females to keep playing the tuba, getting the opportunity to show them that they’re not alone in their struggle to break this stereotype. How did you decide upon your field of study? When I was in elementary school, I was involved in a number of different activities. Singing and playing my instrument were easily the best of these. My mother did not have to drag me to lessons for these, like she did for the other activities I did. Instead, I dragged her. I loved everything about music, about the sounds and the feel of playing my instrument, about creating something that people loved. This passion and this fascination for all music never went away, but it was especially pronounced for the tuba. Every tuba player has their own sound, their own connection to the instrument. So the tuba allows me to do something new and different that is totally my own. It’s ultimately the best way that I have to express my authentic self. I think that there is a certain drive in the world itself that flows through each of its inhabitants. Everything in the world is intimately connected in a way that is somewhat hidden from us. I can see this when I play my instrument. This connection that I feel to the world drives me to continuously improve not only my skills as a tuba player but also as a person more generally. It inspires me to be courageous, to stand up to abuse and injustice. It inspires me to be disciplined and concentrate on what I need to do to get better. It inspires me to be fair and help those who truly need me. It inspires me to take care of myself so that I might be the best person that I can be. It inspires me to be forgiving since everyone is just trying to navigate the world the best they can. And I think we all need that. We all need to be inspired to be the best, to make some difference in the world. I want to earn my PhD in tuba performance and inspire younger people to express themselves in music and to create themselves as good people. I see myself continuing on with my military career, performing professionally as a soloist and as a member of an ensemble. More than anything, though, I want to make a real difference in the music world by breaking barriers as a female tuba performer and composer. I have someone I would like to nominate as an exceptional female student. Her name is Lisa Thiel and she is a fourth year music major. 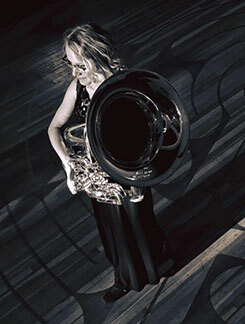 Lisa Thiel is exceptionally bright and has developed into a fantastic tuba player. The tuba is often considered an instrument for men, due to its size, volume, and low register. Lisa breaks through these outdated stereotypes by playing the instrument with great facility and musicianship. Additionally, she is one of the loudest tuba players I have every encountered. In the nearly three years that I have been working with her, she has continued to demonstrate tremendous work ethic by performing literature that is well beyond the capabilities of a normal fourth year tuba student. Indeed, I have known many master’s and even doctoral students who don’t play with as good of sound as Lisa does. Lisa’s accomplishments go beyond the school of music. Lisa is regularly asked to teach and work with Canadian military music programs. Just recently, she accepted a paid position to play with The Regimental Band of the Royal Winnipeg Rifles.